Strategy: QuantumFXBot trading style is not known at this time. We will update this description when we figure it out. Not an official vendor account of QuantumFXBot, it's better than nothing. Warning, FXblue.com is not a legitimate 3rd party verification site, so there is no guarantee these results are real. While QuantumFXBot is reasonably priced, there are much better robots available to risk your money on. We can't recommend this at this time. This isn't considered a full blown scam just yet. 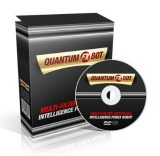 If you have tried QuantumFXBot then feel free to give a rating and post a review with your findings.